Is the Consumer Really Back? Readers with any financial responsibility may find this difficult to fathom. The Journal is attributing the recent increases in consumer spending to the fact that overly indebted individuals have had their slates wiped clean. Now, it is being suggested, these reckless spenders are free to run up the tab again. As crazy as this sounds, it might makeactuallysense if there were anyone around to lend them the money. In my humble opinion, our explanation is more plausible. First, there is obviously a certain degree of pent-up demand by all consumers following a year in which belts were tightened more than at any other time in decades. Consumers put off major purchases while discount stores like Wal-Mart benefited from a new-found sense of frugality across income levels. Second, we all heard stories during the recession about how wealth-flaunting was “out” and frugality was “in.” What we are seeing now, in our opinion, is the well-to-do are going back to their free-spending ways. High-end retailers of all stripes have posted some meaningful sales increases in recent months as more affluent consumers bask in their stock market gains. In a nutshell, we are still seeing the same kind of bifurcated retail market that we saw for much of the 2000s – more affluent consumers are driving the spending gains while moderate and lower-income consumers continue to suffer from stagnant incomes (if they have jobs at all). What is clear is that the recent strength in consumer spending is not supported by the typical drivers of spending: income and credit growth. 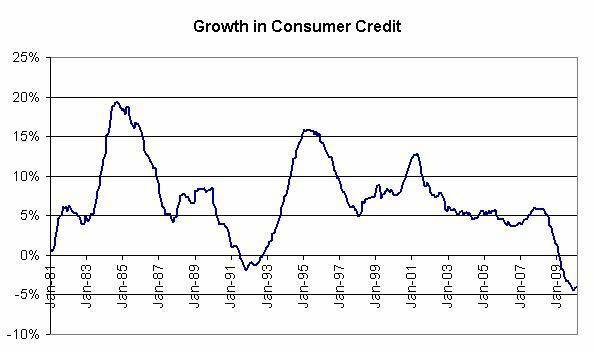 According to the Federal Reserve, consumer credit decreased for the twelfth straight month in February – the largest and longest contraction in consumer credit since the Fed started tracking this metric in 1943. And according the Bureau of Economic Analysis, personal income has contracted for four straight quarters (on a YOY basis). 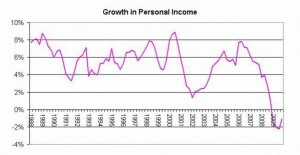 In the fourth quarter of 2009, personal income remained below the level reported for the fourth quarter of 2007. While incomes have rebounded modestly in the first two months of 2010, the gains have not been enough to support a strong rebound in consumer spending. We would read the recent data this way: Unless incomes start growing and/or banks start lending, recent gains in consumer spending may be short-lived. Stock market appreciation simply cannot drive a sustainable increase in consumer spending without income gains, and the majority of Americans are still highly dependent on credit. And one final word of warning. The lowest interest rates in decades have kept debt service ratios down despite continued high debt levels. Needless to say, any increase in the general level of interest rates could be very painful to a consumer carrying an extraordinarily high level of debt. We are not getting overly carried away with all the “V-shaped recovery” rhetoric. There are still a lot of obstacles to sustainable economic recovery, and it seems the consensus opinionwants to discount these risks. As such, we remain invested in companies with stellar balance sheets, excellent management teams and defensive business models.